Almost to 299, but I just can't get motivated. Progress as of today: 37 lbs lost so far, only 6 lbs to go! Well, heck, where you been? Just keep moving when you can! Just a little bit - it doesn't have to epic! You can do it! Looks like you have lost 18 lbs since last post. Did you join Curves? You've made major progress, congratulations!! But I need somewhere to put my thoughts, so here it goes . . . . I have been slacking these past two weeks, that is in eating healthier and exercising. I just got no motivation to go/do anything it's just laziness. I went to Curves one day last week, and I did walk 2 times yesterday but it was cut short. Total minutes 70 minutes, that doesn't include today, if I decide to go walk again. As for the eating part, well being on a limited budget doesn't help. But I am trying to eat better portions, it's just not the healthiest of choices. I know I need to go get some groceries soon. Ok it wasn't all for laziness, I did have to have a tooth extracted and that was my downer, cause my whole jaw hurt, and the pain meds knocked me out for couple days. But now that I am better and I can eat pain free, then things are going to be much better. Progress as of today: 19 lbs lost so far, only 24 lbs to go! you know, you mentioned curves and i think i'm gonna do it too!! haha, i've always thought that curves must be great exercise, the circuit and resistance training that it is. i've always wanted to try it, maybe depending on the price, i'll do it for something different/change of pace. i'm starting to get utterly bored with my weight training routine! i ust to go to CURVES . Wow! it's been another long time since I was here. But I'm still up in the 300s of my weight and have had many changes here at home so that was a big factor in stressing. Now, I am a stay at home grandma, with 2 grandkids (4yrs & 9months) a stepgrand (21) who had a baby boy (5 months) so my days are full. I love em, and I believe my beloved son RILEY and GOD sent these beautiful babies to us. This past week I decided to get back to Curves and went for 3 days but this morning they were closed so there went my plans for a week of Curves. I am planning to do some walking later this evening though to make up for it. Progress as of today: 25 lbs lost so far, only 18 lbs to go! hey Joanne nice to know there are some big beautiful grandmas on here. good luck on your weight loss. Hi Joanne. Welcome back. Glad you hear you haven't given up on yourself! No reason to do that - for sure! Keep posting and come see us often. The Diet Diaries Facebook group is a completely secret group that allows members to be more involved with individuals by participating in challenges and ongoing discussions about mental and physical health (as well as some fun non-health topics). Are you concerned about privacy? No worries, I created this group to be completely secret so your FB friends will NOT be able to see that you are a member of this group or the posts you leave on the group page. Its totally confidential! Glad to see you're back! Never give up on yourself~This is a journey~I'm looking forward to cheering you on!!! Wow it's been a long time since I was here. I guess now is the time to start writing and get moving. I've been grieving for my son, my baby for 3 years 8 months. 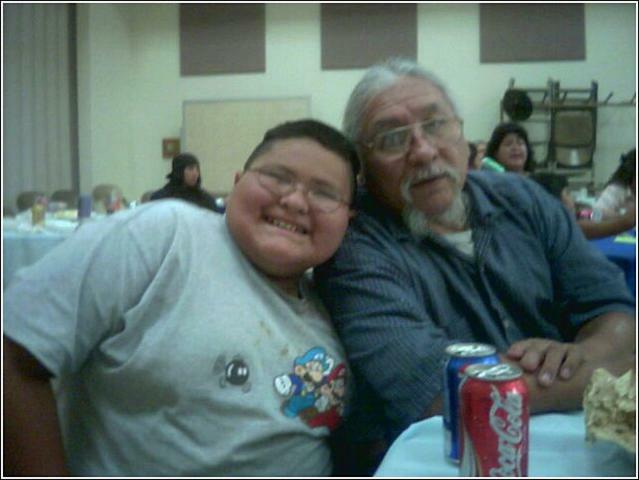 My son RILEY journeyed to Heaven on March 3 2006, he was 10 years old at that time. My son had asthma and caught pnomonia really fast, and I was with him when he collapsed. We did all that we could to try to save him but it was not GODs plan, I'm having the hardest time right now especially for these two months. I've also been diagnosed as being depressed because of the grieving and I'm working with the doctor to get through this. Meeting others has shown me that the majority of parents who grieve for their child have gained weight, averaging about 10 pounds each. For my weight gain, I think this was part of it and also being under a lot of stress, because I also was trying to finish school. GOD did bless us with a grandson, and him and his mom (my daughter Camie) live with us. This little boy has brought some very joyful times, and I feel that this a big part of GODs plan. I am now a stay-at-home Grandma, and we also have become foster parents to one of my nieces. So things are working out ok and I need to just trust GOD and let go of my pain. I realize that I am here for a purpose and that I need to be in my best shape possible. Be blessed my DD family. Progress as of today: 6 lbs lost so far, only 37 lbs to go! I can't imagine the pain you are suffering. I'm glad you're back on DD's with your friends who will help you. I'm back too after an absence of 2 or 3 years. Progress as of today: 6 lbs lost so far, only 27 lbs to go! welcome back! looks like you've made progress so far! Yes, welcome back!!!! Good luck in the new year with all of your goals! Welcome back, good to have you here again! I am SO sorry to hear about the loss of your beloved son, Riley. The tribute you wrote to him is simply beautiful. I know he is watching over you and your family. My thoughts and prayers are with you during this very difficult time. My Diet Diary Friends Friday, March 3, 2006 my beloved baby boy RILEY (age 10) journeyed to HEAVEN. I know GOD does things for a purpose and I accept this was his will, and at this time I know my baby Riley is there in Heaven. But right now my heart hurts so bad from missing him, so please I need your prayer for strength to get through these days. I thank you all for being my friends. Dear JoAnne, I'm so very sorry to hear about your son. I don't know quite what to say except you brought me to tears. I know nothing I can say will help your pain but just know that I am here and I will send lots of prayers for you. And I will check out your live journal. Lots of big hugs to you. 365 Words of Well-Being for Women (by Rachel Snyder) "ACCEPT" recognize what you can change and what you can't. In every moment accept that everything is as it should be. Accept that you can't do it all-and who would want to, anyway? Accept a kind word. Don't accept things that aren't yours, like misdirected shame and blame. Accept everything you are and nothing you are not. terrible spell with a single kiss.